Random House Books for Young Readers, 9780375864377, 240pp. Cheesie—with a little help from Steve Cotler—writes about family, friendship, and tough choices in an unforgettable voice that will have kids laughing out loud. Readers of Diary of a Wimpy Kid will love both the clever humor and the black-and-white illustrations throughout. STEVE COTLER is a retired Little League catcher who's also been a shoe salesman, telecom scientist, singer-songwriter, Apollo 1 computer programmer, Hollywood screenwriter, Harvard Business School MBA, investment banker, and door-to-door egg man. He lives with his wife and writes in Sonoma County in Northern California's wine country. He thinks he is and always will be eleven years old. Visit Steve online at SteveCotler.com. Visit Cheesie at CheesieMack.com. "Readers will be happy to learn that Cotler's debut is the first in a new series. Cheesie chattily narrates his own story; his voice rings true, and the other characters are a gently quirky, appealing lot." 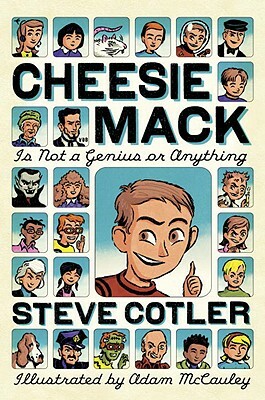 "Fifth-grader Ronald 'Cheesie' Mack's problems (like how to outsmart his evil older sister June, aka 'Goon') may be ordinary, but in the hands of first-time author Cotler they're plenty entertaining." "Cheesie and his book are basic, good old-fashioned fun." "A lighthearted and fast-moving read for kids looking for middle-school shenanigans." "The pleasures are in meeting a new friend--and in the promise of a sequel to this debut novel."